Nigel Farage’s latest UKIP ad has drawn huge amounts of criticism, considered to be so tasteless that it could contend for a Chip Shop Award. Regardless of its message, the Breaking Point poster proves that great advertising is timeless. I’ve written about Andrew Rutherford’s poster before because it embodies what the perfect ad needs; a great slogan, a powerful image, and a bit of cheek to make you think. Unfortunately Farage’s effort doesn’t quite match up. In fact, once you get past the strikingly similar imagery, the Breaking Point poster is a pretty poor effort. Gone is the knowing link between the image and the headline, replaced instead with a stark (unverifiable?) claim. Rutherford’s poster was guaranteed to polarise voters, but it at least appealed to Conservative voters. 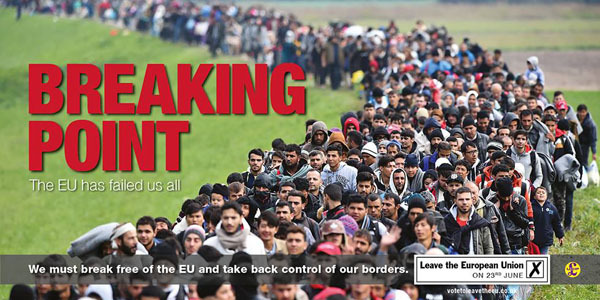 Farage’s poster lacks any kind of wit – severely limiting its appeal. The as is unlikely to boost support for his party or policies – which means it has failed to fulfil its purpose. And the copy is so dry and bland it could have actually been written by a politician. Breaking Point follows the great advertising tradition of stealing from the greats. But it goes on to squander that opportunity. The poster has faced plenty of criticism, even though it’s not the only awful effort to have emerged during the EU Referendum campaign. While most will remember the past three months for the scaremongering and dirty political skirmishes, no one will remember any of the ads. Unless the complaints about Breaking Point are upheld and Farage is charged with a hate crime of some kind. Could it be that we advertising creatives have also squandered our opportunity to bring some intelligence and wit to the debate?